A few years ago Cosmo and I traveled abroad for the first time. It took a lot of research and planning to ensure we had all the correct paperwork done ahead of time so that our trip could be worry free. Now, we’re about to head off again -- this time to Rome and Milan! The planning has been easier this time, since we already know what to expect. But there are still a number of things that need to be done before traveling internationally. We collected lots of information from our vet, the airlines (we are flying Delta), the Italian Embassy in the United States, APHIS/USDA and the CDC. Here’s what you need to know if you’re planning a trip from the U.S. to Italy. Check with APHIS about international animal export regulations. You can locate your local APHIS veterinary service office here. For Italy travel, we needed to obtain a bilingual certificate filled out and signed by our vet. Then we sent the certificate to our local APHIS office where it received the required stamp from USDA/APHIS. The “Certifico Veterinario” must include your dog’s microchip number and rabies information and be completed within four months of travel. Contact the Italian Embassy in the U.S., which tells you pretty much the same things... that you need a bilingual certificate with rabies and microchip information. You can find the bilingual certificate on the embassy site here or on the APHIS site. Check with the CDC about bringing your dog back to the U.S. Here’s the link, but it basically says that you’ll need proof of rabies vaccination. We got our Certificate of Vaccination from our vet. Visit the vet. Our vet filled out all the paperwork and gave Cosmo the required health examination which resulted in one final piece of paperwork. The health certificate must be issued by a licensed veterinarian within 10 days of transport. That sounds like an awful lot to do, but for us it all boiled down to two trips to the vet, one phone call and paperwork sent to USDA/APHIS, and some time spent looking at these links online to make sure nothing had changed since we last traveled to Italy. When traveling by air, you also need the check with the airline for its specific requirements. Before we booked our trip on Delta, we called the airline to ensure there was pet space available in cabin and then we reserved that space. Dog Jaunt, one of our favorite blogs for small-dog travel info, includes this handy list of airline policies for international in-cabin pet travel. You should still check with your airline to make sure you know the most current policies. When traveling with a pet, you also need to allow a little extra time at the airport for check-in. Delta is recommending we get to the airport three hours ahead of time for international travel with a pet. You can read more about preparing your dog for in-cabin travel here. Cosmo enjoys traveling in his large, soft-sided SturdiBag. Its 12x12 x18 measurement is the largest allowed by Delta for in-cabin travel. Wow Cosmo your going to Italy! How neat! My dad wants to go there one day...now I can tell him he has to take me with him! Preston, you totally need to go to Italy!!! You can even go inside the restaurants! Last time I was fed handfuls of chicken at my favorite mangiaria!! Thanks for the shout-out, Diane, and for this super-useful post! Have a wonderful, marvelous time in Rome and Milan -- oh, the envy!!! Thank Mary-Alice! Your blog has LOADS of useful travel info! We'll post all about it when we get back! Sounds do fun! Great educational post - I always thought when traveling overseas with your pup they had to be quarantined. I've been wanting to go there forever, and now that I know this, maybe I can take Toby with me! Have fun! Michelle, our experience with Italy was very easy! Different countries have different requirements. 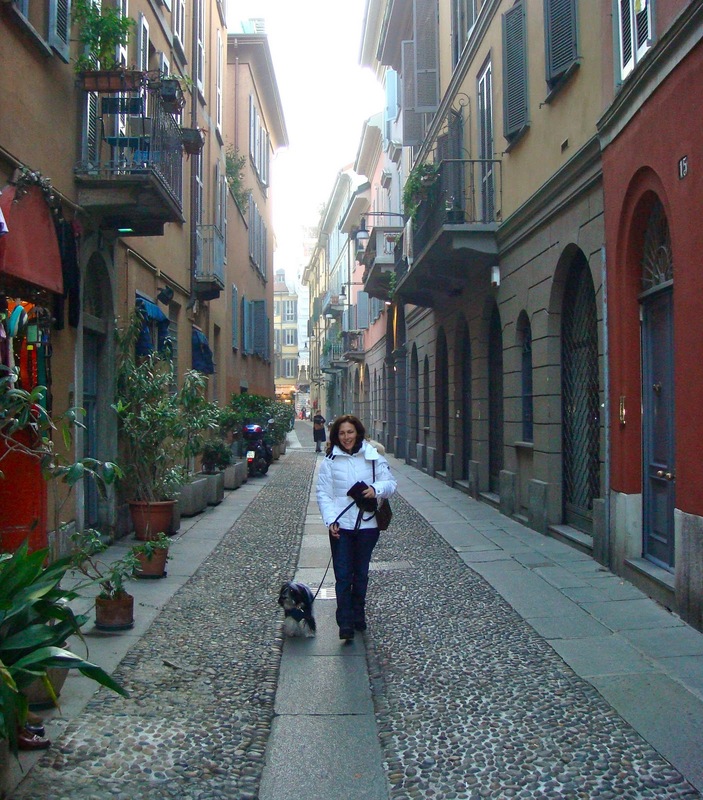 But Italy was a great place to take a dog and we could go just about EVERYWHERE! Cosmo enjoyed the restaurants! Ofur there in Europe they do be WAY more dog furrendly than here. In Germany you can buy a 24 hour ticket fur the train wot says "Good for 2 adults, 2 children and 1 dog." Imagine that! And yes, dogs can go in the restaurants, too! You has a great time, Cosmo! I wish I woz smaller so I could go but can't squeeze this big behind into your carrier. O what fun! I hope you have a wonderful trip! If my puppy was a little smaller and a little less claustrophobic I would love to travel with her too. Bon Voyage! Take lots of pictures! Sounds like lotsa fun! Hope you guys have great fun! APHIS decided to change from lifelong licenses to issue health certificates to requiring continuing education and reapplication every few years to remain licensed. WOW u iz goin to italy agin dat iz pawsum. ma humanz always wanted to goes der. I hopes u haz funs and gets home safe and sound. Thank Coleen. That's a good info to know about. We'll plan to tweet some pics from @CosmoHavanese and we'll post about it when we get back too! This is great info. I am going to pass along the info. to our readers on Twitter and Facebook. Buon viaggio Cosmo! i wish you'd post a picture of the SturdiBag and a link. A pic with Coz in the bag would be great. your blog is awesome. Everyone mentioned should totally comp you. THANKS SO MUCH for the fantastic service you're providing us all. i actually went online and found the bag. cool. Zoe says to tell coz to send lots of cool pix and have a pawsome time!!!! I'm going to post more about the stuff we take with us... just haven't gotten to that post yet!! Safe travels Cosmo and Diane ! Great info!!!! How tall/long is Cosmo? I'm from Italy and I would like to take my little Tessa with me next time, and I have a Sturdi large bag so I'm curious to know how Cosmo fits in it. Francesca, Cosmo travels in the large SturdiBag very comfortably. He's 10.88 inches tall at the withers (shoulder) and 14 inches from collar to tail. He sleeps curled up most of the time so there's plenty of room for him. He shifts positions on occasion, but seems very comfortable. Cosmo's a Havanese. What kind of dog is Tessa? Any places you recommend in Rome and Milan? I know that's a huge question! Thought you might know of something not known by the tourists! Hi Diane! Tessa is a terrier mix, she is 13 " tall at the shoulders and 15" long... I think the Sturdi bag is a little bit tiny, but I'd be willing to give it a try if it's not a pain for her such a long flight (I would anyway get at least a 3 hour stop between flights to let her walk outside the airport). Do they check the bag dimension at the airport? I'm from Milan, so I have plenty of suggestions. For sure visit the Duomo, Galleria, Teatro alla Scala. From the Duomo you can walk to the Sforzesco Castle and see if there's anything interesting going on while you are there. Then you can go to Via Spiga and via Montenapoleone, which are very beautiful streets. I love the Church of Sant'Ambrogio, the whole piazza is actually really nice! Nearby there is Santa Maria delle Grazie, with the Last Supper by Da Vinci. And, if it's open, neat the Duomo there is a little church called "Santa Maria presso San Satiro. It's not impressive from the outside, but is famous for its deceptive perspective inside, that was adopted to compensate for the lack of space in which to build the apse. An area that is less for tourists but really pretty is the Navigli (the old channels built to transport marble to the Duomo...). At night they are full of lights and restaurants. I could write forever, but hope this helps. Let me know if you have any questions! Enjoy your trip with your Cosmo! Francesca, the airlines have never pulled out a tape measure at the airport during my travels, but I have heard of folks having their carriers measured and getting denied. They had the option of sending their pet in cargo or going home... not a great situation. That's why I looked for the largest carrier allowed. BTW, Cosmo weighs 16 pounds. He's short and kind of long! Thanks for the great info on Milan! Two more quick questions: Is there anything special you would do in Milan on New Year's Day? Are there Milanese traditions, like a special New Year meal? We may also train to Como on the 1st for a walk above Brunate (if the weather cooperates). Is there anything special you would do in Como? Regarding New Years Day, in Milan the traditional food we have is "cotechino with lentils and mashed potatoes. Cotechino is kind of a big sausage that we boil. Zampone is another version for it, we same meat but compressed in pig skin and leg. They are both kind of heavy, I don't know if they would match the American taste. But it's our tradition. As dessert we have a bread that is called "Veneziana" and it is similar to panettone. One thing that you should try in Milan when you are close to via Montenapoleone and the downtown area is hot chocolate at a pasticceria called "Sant'Ambroeus" (http://www.santambroeusmilano.it/). They say it is the best in Milan, and their pastries are excellent as well! In Como I'd just walk around the city, which is pretty, and if they offer a tour of the lake on a boat, it might be nice to do, if the weather is good. If I can think of anything else I'll post it here! Thanks for the tips, Francesca! I used to travel with the large Sherpa and never had a problem with it. But I had a friend with a different type of carrier (even longer) who got measured at the airport. That's when I decided to look for something different. In my experience, though, I had no problems with the large Sherpa... just so you know! Very good tips & a beautiful dog! Different countries/cultures may make the process easier or more difficult but it's very rewarding when you are able to take your companion with you so you don't have to worry about a babysitter! That’s great have a safe trip Cosmo! Well the info in the post was all so helpful especially the certification of your vet after the vaccination. Travelling with dogs is a hassle but worth it. The look in their eyes of enjoying the trip with their master is worth it. Great article. Thanks for the info, it’s easy to understand. I will try to bring my dog with me. BTW, if anyone needs to fill out a Rabies Certificate of Vaccination form, I found a blank form here. Thank you for posting your examples of Explain Everything.